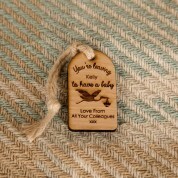 This wooden tag makes a lovely finishing touch for an expectant mum's gift. 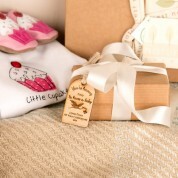 We personalise each tag in house with your personal message and the mum to be's name. After the present has been opened, she can keep the tag and hang it up in the kitchen on a pin board or a cupboard handle. It will act as a special reminder that her work colleagues, friends or family are there to support her throughout her final months of pregnancy and when her little one arrives. It is the perfect leaving gift for a work colleague who is going on maternity leave or gift for a friend who is having a baby or a baby shower gift from friends or family.